Almost all cars now have air conditioning so it’s important you at least have a basic understanding of how it works and the components involved in the aircon system so you can be aware of any issues and potentially address them if needed. Or, of course, contact us at Cool Car and make use of our expertise. Hopefully, this section answers any questions you may have, such as how the system works, as well as some tips on how to get the best out of your car air conditioning system. Why is my car aircon not working? Your car air conditioning may not be working for a number of reasons: It may not have enough refrigerant; it may have leaked out as it does over time; or you may have a fault, such as the compressor no longer functioning, the pressure switch being broken or there not being enough oil in the compressor, making it noisy. A whole host of reasons. 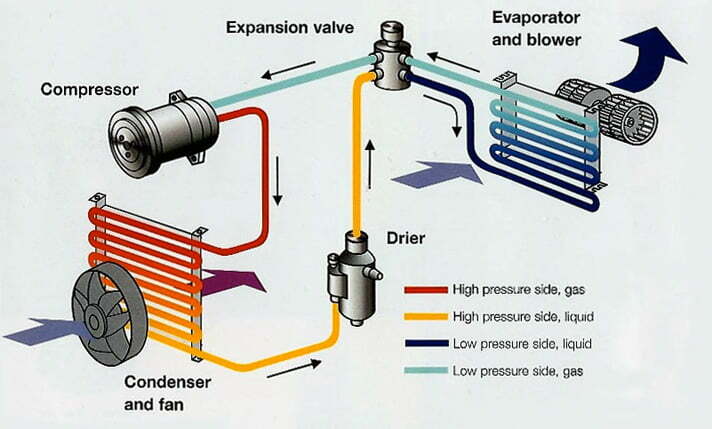 The aircon compressor, otherwise knows as the air con pump, is the heart of an air conditioning system. It takes refrigerant as a low pressure gas, pumps it up to a high pressure gas, and circulates it into the discharge hose. Compressors are much like little engines. Most of them have pistons, piston rings, a crank shaft and bearings, just like a car engine. They need to have oil circulated through them to lubricate all the moving parts. This oil is mixed into, and carried with, the refrigerant. That is why running the aircon without any refrigerant is like running your car’s engine without any oil. Why would I use my car air conditioning? Warm dehumidified air in winter; easily demists steamed up windows! Filters pollutants/airborne particles, inc. pollen, helping allergy sufferers! Sometimes I get a smell when my air con is on! The origin of the smell is caused by fungus, bacteria and other microbes growing inside the evaporator core, which sits behind your dashboard. The moisture-laden environment is very conducive to the growth of these organisms. As car makers downsize components to save space and weight the problem has increased. This means that because the evaporator is now smaller, more fins are used and packed closer together to increase the efficiency. This in turn has made it more prone to trap moisture that contributes to the growth of these organisms. We offer a full odour removal service using the latest research, tools and equipment. Contact us to find out more. Does my fuel consumption go up if I use my Air-Con? The answer to this is ‘yes’, it does. This is because of the extra load the engine is having to service, more friction on the belt that turns the compressor, etc. However, think of the alternative. You could have the windows open, but that would increase wind resistance which can add up to 10% to your fuel consumption, especially at speed, and don’t forget the extra noise and pollution through that open window. Also, it’s worth pointing out that you should run your air conditioning at least once a week, especially in winter, as the seals can seize up through non use, potentially costing you more in future in new parts and repair!!! Your air conditioning system can lose 10-15% of it’s coolant every year, so a 3 year old car may have lost a third of it’s coolant, seriously impacting on the performance of the system and damaging the components involved. You should regularly have the air conditioning system serviced to reduce wear and tear on the components and help avoid potentially big repair bills. We offer recharging and servicing. As previously mentioned, through non use, seals can seize. Your car manufacturer, when they service your car, only tests to see if the air conditioning works, not that all the components are in full working condition. Regular air conditioning system servicing ensures the system is full of coolant, that there are no leaks, that the pressure is correct and that the hoses, seals and pipes are all in full working order. Don’t wait for the system to fail, get it checked at least every 3 years. Turn the air conditioning on, ensuring that it’s not set to ‘economy’ mode. When you first get into a hot car, open the windows, ensure that the air vents are set to face level and the system is set up to do the same, not pointed at your feet. Remember cold air falls. Turn the temperature as low as it will go and the blower as high as possible. Also, make sure that the air is on ‘recycle’ mode and not taking air from outside. Better to cool already cooled air! When the temperature is more comfortable, close the windows and increase the temperature to a more suitable level as well as decreasing the blower speed. You should also point the air vents upwards to ensure the cold air flows down again.